BOB's Custom 'Bob Avila' Cowhorse/Cutter/Penner, Light Oil, basket-stamped. Fits most QH type horses. 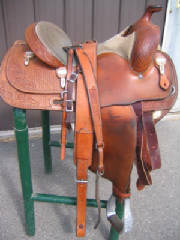 Very good condition, front(mohair)cinch and back cinch. Light colour, lots of silver. Stirrups are white oak with walnut inlay. Looking for decals for your trailer and truck ?